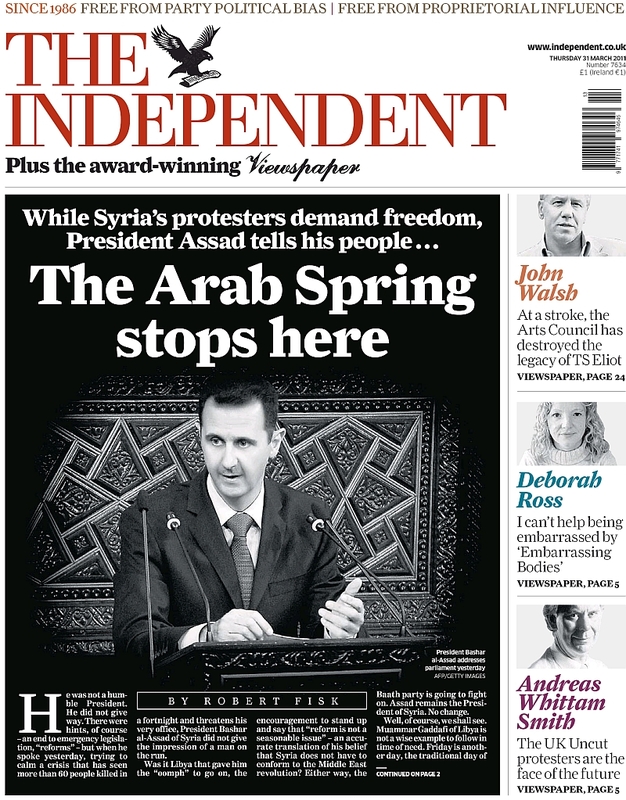 Below is a compilation of articles published by Robert Fisk between March 31 and April 29 in The Independent. Witnesses who fled across the Lebanon border tell Robert Fisk what they saw. Could Assad’s regime be on the road to civil war? If the dead soldiers are victims of revenge killings, the opposition is prepared to use force. Every dictator knows that, when he starts making concessions, he is at his most vulnerable. But what if the spirit of rebellion spread to Iran? A new paperback thumped out of my mail package from London this week. Can Assad do what it takes to cleanse his regime? There are those in Syria who say it is over, there is nothing the President can do. It began not in Tunisia this year, but in Lebanon in 2005. While Syria’s protesters demand freedom, the President has a stark message for his people. Libyan scenario for Syria: Towards a US-NATO "humanitarian intervention" directed against Syria?